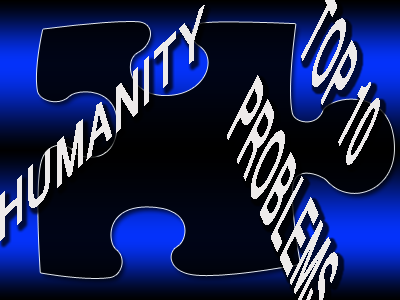 There are many issues currently threatening humanity. Here are some of the most critical issues that come to mind. Issues that humanity must figure out if it is to survive the current fight against the controlling class. Perhaps at some point we will figure it all out. Changes never happen overnight; and, as a whole, most Americans hopefully do have a few things in common. Surely one of the solutions is to look for what we all have in common and see how we can all work together to improve things. Coming together on wider platforms is also a key to moving forward. Here are the top issues and potential solutions. John F. Kennedy warned of the dangers of secret societies making decisions for humanity. More on this speech later. Secrecy of government could be number one on this list. Ultimately all of humanity's problems stem back to government secrecy. From CIA to the Pentagon, to CFR, Bilderberg secret meetings, to the Masonic groups, secret fraternities and more, secrecy is the norm in this government and is the building block upon which all other forms of deception are built. This secrecy is not spoken about enough because we are all conditioned to believe that government needs to be secret. All state crimes are secret. All evidence against government is secret. All covert crimes are protected from exposure due to the nature of the beast. See any problems with this? There are no scenarios where humanity will be able to thrive while state crimes and illegalities are all secret. We will never have legitimate elections, and activist groups dedicated to truth and justice will always fight against the wall of secrecy that humanity is up against. Conversely, governments that operate in secret are obsessed with making your life known to all. It is a crime in every scenario for you to not divulge the truth about yourself or to not speak the truth to a police officer or a member of the courts. The individual is immediately charged with perjury. Government, however, as well as police, can lie to you, trick you, and hide the facts from you often without any consequences. Amazingly, one of the mysteries of our generations dating back over one hundred years is how a private cabal of non-government business guys can actually be given a status that is clearly above the law. How can an entire generation accept slavery under the authority of men who can and should be arrested, tried and imprisoned for life? How can a private entity tell the government what to do, lie, cheat, steal, even create money out of thin air and then charge the government interest without real consequences. How can they pull this off even in the age of information and the Internet? The question is as amazing and mind-blowing a question as there is. I don't know the answer to this and I don't know anyone who does. We know all about the private illegal creation of the Federal Reserve and we know all about their illegal banking schemes whose termination could heal all of humanity with one stroke of a pen, yet no one dares act upon this. That is, except John F. Kennedy - and we know what happened to him. Without a doubt the Federal Reserve banking scheme and collectively the global banking scheme to include the IMF, BIS and World Bank makes my list of the top threats to humanity. These bankers are the ones profiting from both sides of all wars. The magnitude of this issue goes beyond the spectrum of this article but suffice to say this is one of the major issues humanity needs to confront. I've written about this many times. One of the greatest problems we face here in America and extends throughout the world because the impact it has on world news, is that propaganda is now legal in the United States. Without a second thought or remorse, the State Department can now carve out what it WANTS to say instead of what it HAS to say. Accountability to the American people is now completely removed. Noticing a lot of bold claims from the State Department regarding evidence and the constant deflection of original sources? Notice how key pieces of "evidence" get released much later from the time the specific incident occurred? Wonder what's happening during the delay or what the U.S. military or local police call the "investigative process"? The massive effect of Hollywood on the minds of millions of Americans is now a grand experiment on humanity. More than ever, children are watching television which has been proven to be a powerful tool of mind control. No other tool is doing more to keep humanity in a state of hypnosis and complacency than TV. It has robbed the young generation of all forms of critical thinking, creativity, passion, focus, determination, and political awareness. It is almost impossible to visualize humanity overcoming our current crisis with the current level of Hollywood and TV propaganda and conditioning. The celebrity gossip and propaganda alone is enough of a threat to humanity to concern anyone paying attention. Lessons of fascism, tyranny, and collectivism can be taught to a person much quicker using television than almost any other medium. Furthermore, there is no easier way to destroy family values, sell adult sexual ideas to kids, lower school grades andreading skills than to expose a child to television. Quietly, pro sports is now a force to be dealt with in terms of survival of the human race and here's why. Pro sports is not just a collection of games and entertainment (MLB, NFL, NBA, NFL, MSL), it is a form of survival for millions of young men, it is a religion for many, it is a ritual, an obsession, an addiction that cannot and will not be broken. It is perceived by all of society to be harmless and fun, and it can be harmless and fun if you are already awakened. For those who are not awakened, sports is a primary brainwashing tool of the globalists. This is their primary military recruiting ground and millions of young men go from watching a TV commercial glorifying the military during a game to dying in globalist wars. We all see how the globalists used the Pat Tillman story as an advertisement to get more kids into the military. Recently, Major League Baseball has been promoting the military using the image and story of Ted Williams. The worshiping of the military at the level of pro sports is reaching dangerous levels. MLB inparticular regularly has promotional days when your favorite team may be seen actually wearing military-like uniforms for the day. Every week we are seeing military personnel literally worshiped by the powers that run pro sports. These ceremonies and dedications are targeting the young kids so that when they grow up they'll want to join the military. Also, this threat to humanity works hand in hand with many of the other threats. Ultimately, sports is selling blind patriotism. Meaning, regardless of the mission, we are Team America (urrrahh). Values, ethics, and morality are not taken into account in the selling of the military. They tell you they represent honor and values and they know they don't need to actually prove it. This selling of blind patriotism is dangerous and encourages closed-mindedness to any information that interferes with your emotional ties to your own country and military. When did science become a government thing? Quietly, over the last 5-6 decades and more, government has taken over science and ignored the prime rule of science. That being the Scientific Method which states that scientists must present their hypothesis then conduct open experiments to prove or disprove their hypothesis. These experiments must be open to public scrutiny, not open to OTHER government contractors but to the true scientific community. Too many Americans who don't like science won't even pay attention to this issue which is one of the major threats to humanity. When government takes over science, that swings the door wide open for retroactive manipulation of scientific results, exaggerations of results, customizing studies to line up with predetermined results, faulty correlations, non-scientific government abstracts of studies that no one in the independent scientific community can verify and challenge, controlled opposition of scientific views, blind claims, even theories that outright defy the laws of science. All of this can be done without any opposition or scrutiny. Sound crazy to you? It should. Government takeover of science is without a doubt what has led to many theories which have paved the road for environment crimes against humanity (chemtrails spraying and geoengineering programs destroying the ecosystem on a daily basis), administration of deadly vaccines (which are now proven to cause autism) and even massive false flags (like the government science of the World Trade Center towers collapse that defy all forms of reason and laws of physics and thermodynamics). In some conservative Christian and right wing circles throughout America we are seeing a deeply rooted belief that says all Muslims are dangerous terrorists except for maybe a few here and there. This ideology of bigotry is no different than other ideologies of hate and bigotry we've seen throughout history. Some of these individuals are blindly convinced that "terrorists" are everywhere and that these "terrorists" (who have by the way never been tried or found guilty of any wrongdoing with facts and evidence) have no rights whatsoever. The terrorists, according to this mindset, deserve lifetime imprisonment without charge, they deserve to be tortured and murdered if necessary. In the midst of this culture of hatred brewing in America, we are now seeing the rise of another wave of hate, bigotry, and what I call linear (narrow-minded) thinking. We've all seen the breathtaking images of atrocities in Gaza committed by Israel, and although Jews around the world are protesting alongside human rights groups against the action of Israel against the people of Gaza, others have chosen to stand FOR Israel despite these war crimes. This recent wave of dangerous narrow-minded thinking, which holds a flag in higher esteem than a human life, is now one of the greatest threats humanity faces. It is exactly this kind of narrow-minded thinking which has served as a precursor to the murder of billions of lives throughout history. We've been warned - those who ignore the lessons of history are bound to repeat it. Engineered race wars are now becoming the norm. Humanity is in one big competition against itself. Parents and children are being conditioned not to trust people of other races, or each other for that matter. Every single shooting death is painted as a race issue whenever possible by the media. We all saw what happened in Ferguson, Missouri. A typical police state murder spun into a race war by the media. Over a year ago we saw Travon Martin murdered by a Hispanic male shooter yet the media spun it into a race issue. As racial division continues, the globalists are enjoying seeing humanity unable to work together. But I am asking them members of the newspaper profession and the industry in this country to reexamine their own responsibilities, to consider the degree and the nature of the present danger, and to heed the duty of self-restraint which that danger imposes upon us all ... I am not asking your newspapers to support the Administration, but I am asking your help in the tremendous task of informing and alerting the American people. For I have complete confidence in the response and dedication of our citizens whenever they are fully informed. I not only could not stifle controversy among your readers -- I welcome it... Without debate, without criticism no administration and no country can succeed, and no republic can survive... It means greater coverage and analysis of international news, for it is no longer far away and foreign but close at hand and local. It means greater attention to improved understanding of the news as well as improved transmission. And it means, finally, that government at all levels, must meet its obligation to provide you with the fullest possible information outside the narrowest limits of national security, and we intend to do it. And so it is to the printing press, to the recorder of man's deeds, the keeper of his conscience, the courier of his news, that we look for strength and assistance, confident that with your help man will be what he was born to be: free and independent. JFK was calling out mainstream media to be responsible because they were supposed to bear the mantle of free speech and ultimately guard our freedom and independence. Looking at this speech one can appreciate how frightening it is to see mainstream media sold out to the very government that we were supposed to be free from. This speech also shows us how far we've come. Is it any secret why they murdered JFK? I agree with president Kennedy and I believe mainstream media has done everything opposite of what Kennedy called on them to do. They don't bear any responsibility for what they say, they are not guarding freedom or free speech instead they demonize it. They do not encourage criticism; instead they tag everyone as a "conspiracy theorist" without any reason or evidence. They don't provide us with the fullest possible information; instead White House Deputy Spokespersons like Marie Harf snap at reporters and threaten to not say anything if she has to divulge her secret sources. Mainstream media is unquestionably the greatest threat to the safety of humanity, freedom and the entire existence of a republic that protects the rights of the individual. With mainstream media now lying, deceiving, and manipulating the truth for the sake of government and political propaganda, now more than ever it is important for everyone to recognize that this is now the number one threat to humanity. No, ISIS and Al Qaeda didn't come close to making my list of most dangerous threats to humanity. The danger with ISIS is the ability of our government to arrange such funding and supply of U.S. weapons and armed fighters (with social media use and all) in such a short period of time. To survive and make our future bright again we as a humanity will have to rise above government propaganda and simultaneously keep working overtime on ideas for solutions to the problems of humanity. It's good to know which are the major problems as well as which are not the major problems.